For some reason I thought this was called “Shimmering Sands,” which seemed both appropriate and alliterative. 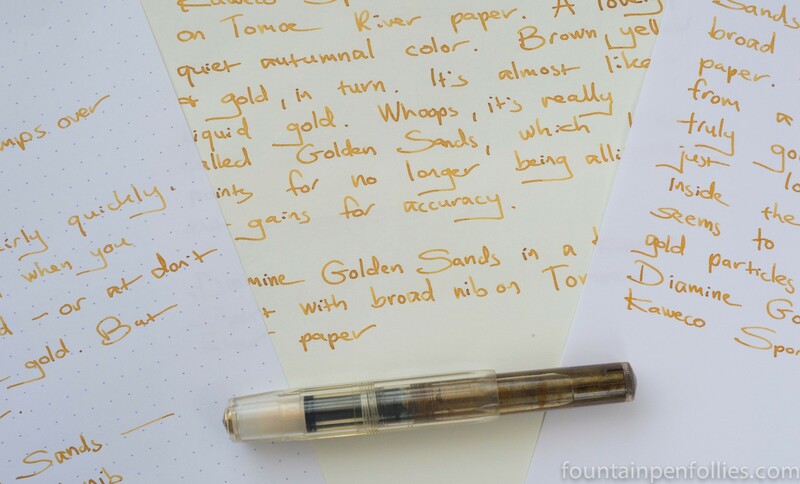 However, this is Diamine Golden Sands, which is more accurate. This ink seems like liquid gold. I think this one will be very popular. Thank you! And stay tuned for Brandy Dazzle, which Golden Sands’ coppery sibling. What a beautiful color! The liquid gold is perfect for this time of year. “Autumnal” is an apt description. I need to check it on dark paper, I really do. I’m very intrigued by the bit about dark paper – would it really have enough opacity to stand out on dark paper? Because that would be the bee’s knees! I love dark papers but I’ve never found FP ink that would show up on them, only heavier inks for dip pen use or even paint.